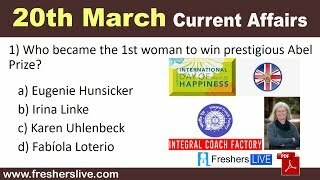 Current Affairs 20th March 2019: Instantly obtain Latest Current Affairs 20th March 2019 with all essential info, Be the first to know all the Current affairs 20th March 2019 top news, Major Issues, Current happenings, Important events in National as well as International level with clear explanation. For all competitive exams and Interviews, equip yourself with the Latest Current Affairs 20th March 2019 granted here. The recent decision of the Reserve Bank of India (RBI) to inject rupee liquidity through long-term foreign exchange (forex) swap, a first of its kind in liquidity management policy, has been received well. On 26th March auction the feedback of the forex swap will be received. The central bank will conduct a dollar-rupee buy/sell swap auction of $5 billion for a three-year tenor, on March 26. In marathon, India's Asian champion Gopi Thonakal has qualified for the World Athletics Championships to be held in the Qatari capital Doha in September-October this year. He achieved qualification after finishing 11th in the Seoul International Marathon, clocking his personal best time of 2 hours 13 minutes 39 seconds. Gopi’s time is the second best ever by an Indian after the four-decade old national record of 2:12:00, which is held by Shivnath Singh. Tsunekazu Takeda, the head of Japan's Olympic Committee (JOC), is stepping down over corruption allegations relating to the awarding of the 2020 Games to Tokyo. Takeda is being investigated by French prosecutors who are looking into claims that a €2 million (£1.7 million) bribe was paid to secure Tokyo's winning bid for the Olympic Games. Takeda was head of the Tokyo bidding committee when it was awarded the Games in 2013, defeating rival bids from Madrid and Istanbul.